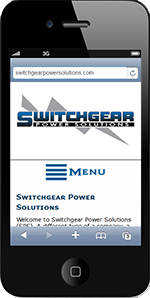 Switchgear Power Solutions is a startup electrical products, services, and testing business in Sheboygan County, Wisconsin. 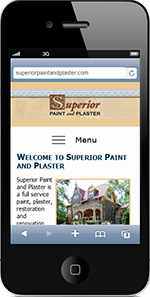 We took over Superior Paint & Plaster's website when owner Jeff Seifert had trouble with hacking and general Wordpress problems. After years of dealing with Wordpress associated issues, Jeff wanted the site out of Wordpress. I recreated the site to look much like it had but used the always functional and user-friendly left, vertical navigation rather than a lot of drop-down menus. The site still looks great and users can find what they are looking for at a glance. 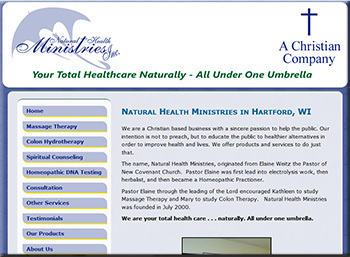 Natural Health Ministries in Hartford, Wisconsin provides many services. They have a passion for helping people and they have served their clientele well for many years. 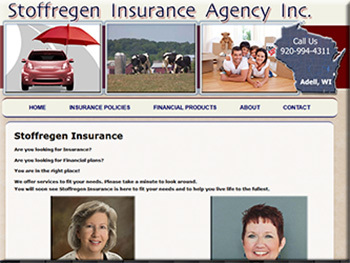 Stoffregan Insurance Agency in Adell, Wisconsin is owned and operated by Bonnie Sande, daughter of founder Ken Stoffregan. 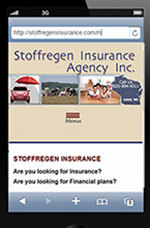 The Stoffregans have been serving the area's insurance needs since 1969. 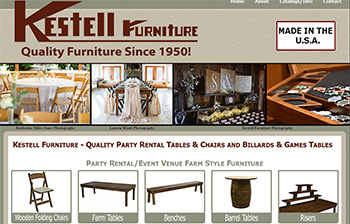 Kestell Furniture in New Holstein, WW manufactures wooden folding chairs for the rental market. They also make poker, game, and card tables with matching chairs. This website holds much more information than first meets the eye. 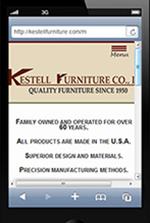 Our goal was to take the information from their old site and display it in a more organized and user-friendly way. We accomplished our goal! 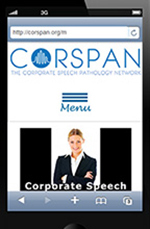 CORSPAN - The Corporate Speech Pathology Network is a non-profit organization dedicated to Speech Pathologists and their clients. This site relies heavily on a database-driven system. Member profiles, Search for Members, and site security all rely on a database to display dynamic information. 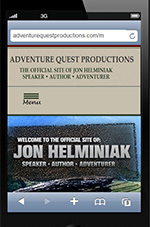 Hundreds of photos highlight the Adventure Quest Productions site. 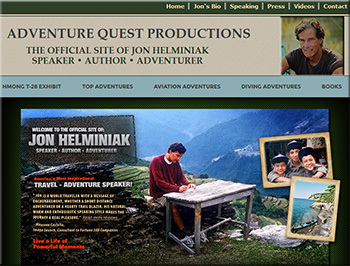 Author Jon Helminiak has traveled all over the world and written several books about his adventures. 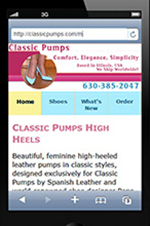 At Classic Pumps you will find the highest quality, most flattering, genuine leather high heeled pumps on the market today. This site was both a challenge and great fun! Their old site had been around since 1992. 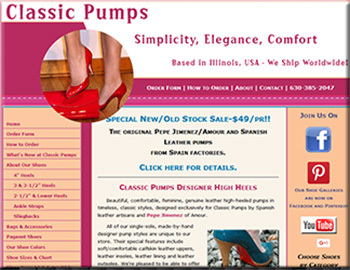 As websites often do, Classic Pumps lost its functionality and user-friendliness over the years. It was definitely time for a new look and some clean-up. It is now a clean, concise, quality site - the kind I like to make! 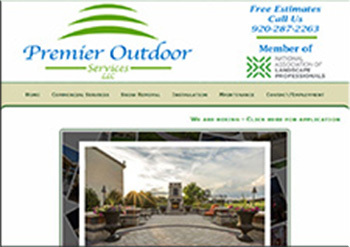 Premier Outdoor Services is a full-service landscape and snow removal business in Sheboygan, Wisconsin. After many years in business, James Coulson, Owner of Premier realized he needed a simple, functional web presence to get his products and services out to area businesses and home owners. 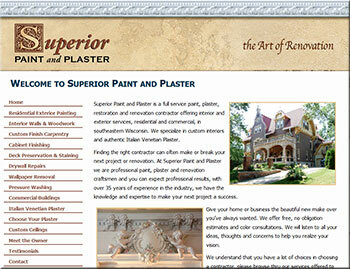 His website highlights his focus on working with business owners to provide reliable, year-round service. 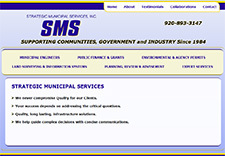 Strategic Municipal Services has been supporting communities, government and industry since 1984. Based in Plymouth, Wisconsin, SMS contracts with municipalities and businesses throughout the state to help with their civil engineer and survey needs. Great food and atmosphere can be found at Idlewile Supper Club for anyone who'd like to take the short drive to St. Cloud. We also have gift certificates for purchase on the website. They make a great gift any time of year. The Fox Valley Wellness and Midwest Hyperbarics website was in dire need of a redesign and update after being updated by staff through a content management system for many years. Their new site includes nearly 40 pages with great content and many photos of staff and facility. 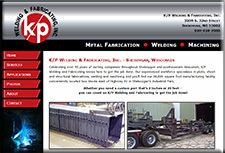 KP Welding & Fabricating owner Saunders Kohn needed a new look for his website. To display their diverse work, I added a photo gallery of recent projects. KP is located in Sheboygan, WI. At Focus Physical Therapy in Plymouth, WI, owner Peggy Huhn and her staff are highly 'focused' on their patients needs and wellness. We wanted to use photos to showcase the hands-on nature of their treatment while also highlighting the equipment that is available to current and 'graduated' patients. Meeting Planner Supplies specializes in providing badge holders, lanyards, ribbons and other supplies for meetings and conferences. Tammy Meyer has owned and operated MPS since 2007. She provides excellent customer service to her customers. 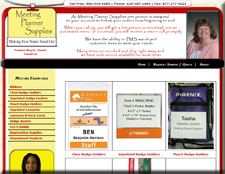 The website includes detailed product information for the majority of products available through Meeting Planner Supplies. 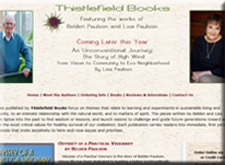 The Thistlefield Books site was created to showcase the books of authors Belden and Lisa Paulson. We continue to expand the website as they write more books. Ordering information is also available on the site. 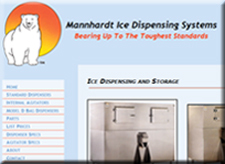 Mannhardt Inc. was looking for a new site design, hosting services and a new domain. Within three weeks we had their site up and running showcasing their Ice Machines, Dispensers, and Baggers. 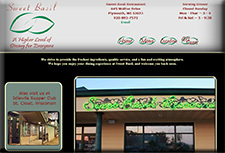 We thought the website for Sweet Basil in Plymouth, WI should represent the elegance of the restaurant itself. The home page features rotating images of the restaurant and bar. The Menu page rotates through many of Sweet Basil's scrumptious selections. Linking to a PayPal shopping cart allows customers the convenience of purchasing gift certificates online. 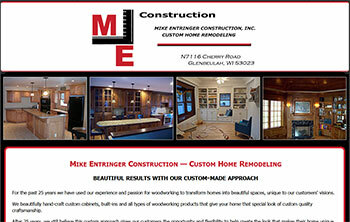 This site showcases Mike Entringer of ME Construction, Glenbeulah, WI and his carpentry business to home owners and potential clients. 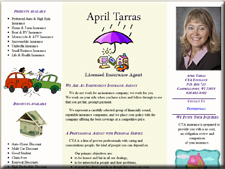 Turning her brochure into a web site was an inexpensive, easy way for April Tarras to connect with current and prospective customers. The essential basic and contact information makes April's business visible at this time and she can add to her site at any time in the future.